VIEWS, VIEWS & MORE VIEWS!! 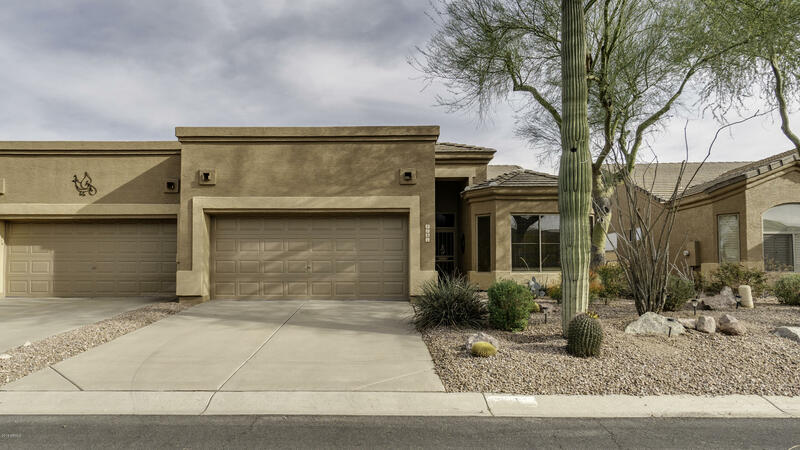 Beautiful casita backs to the 15th fairway of the Sidewinder Golf Course with the pond as your buffer and stunning views of Dinosaur & Superstition Mountains from your back patio! Eat-in kitchen is open & bright w/bay window & newer stainless steel fridge. Formal dining room area opens to the living room. Split bedrooms-master w/walk-in shower & closet. Second bedroom with bay window. Upgrades include 20'' diagonal set tile throughout with tile baseboards, stylish light fixtures, sunscreens, newer hot water tank, soft water system & R/O; Trane AC is 3 years old. Home comes fully furnished w/beautiful Thomasville furniture! Owners took meticulous care of this property. Don't miss seeing this special home & exceptional location! This is an active 55+ community!